Summary: Excoriation disorder is a condition characterized by self-inflicted skin lesions caused by repetitive picking or scratching. As there is no obvious physical cause that can be found, it is understood to be a physical manifestation of emotional distress. It is also referred to by the following names: skin picking disorder, psychogenic excoriation, neurotic excoriation and dermatillomania. Excoriation disorder results in impairments in social functioning and comorbid psychiatric disorders often exist. 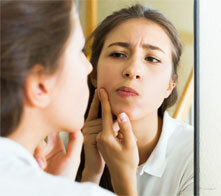 Skin complications such as infection, scarring and disfigurement are also common. Interventions include counseling, medication and treatment of skin complications. Patients often turn to their primary care providers when faced with emotional distress. As such, the primary care provider has an important role to play in identifying the disorder and implementing a multidisciplinary approach to management. A 35 year old female comes to your office complaining of itchy skin and a lesion on her forearm that she thinks is infected. She describes an intense urge to scratch and pick the skin on her arms and legs, which has resulted in bleeding, scabbing and even some scars. She describes herself as a worrier and feels a sense of relief after the behaviour. The behaviour is getting worse and she is worried about developing more scars. She already avoids social settings throughout the spring and summer when clothing exposes the skin lesions and scarred areas of her arms and legs. How are you going to help your patient? Excoriation disorder is a diagnosis of exclusion. Location: What parts of your body do you pick? Timing: How often do you pick your skin? For how long do you pick? Method: Do you use anything besides your fingers to pick your skin? Severity: Has picking your skin resulted in medical complications? Do you find yourself avoid social situations as a result of your skin picking? Context: Can you describe how you feel before, during and after picking your skin? Impact: Have you ever tried to resist picking your skin? Does the behavior cause you significant distress? Recurrent skin picking resulting in skin lesions. Repeated attempts to decrease or stop skin picking. The skin picking causes clinically significant distress or impairment in social, occupational or other important areas of functioning. The skin picking is not attributable to the physiologic effects of a substance (eg. cocaine) or another medical condition (eg. scabies). The skin picking is not better explained by the symptoms of another mental disorder (eg. delusions or tactile hallucinations in a psychotic disorder, attempts to improve a perceived defect or flaw in appearance in body dysmorphic disorder, stereotypes in stereotypic movement disorder, or intention to harm oneself in nonsuicidal self-injury). The use of physical barriers such as an Unna sleeve may help prevent picking easily accessible areas. Referral to a psychiatrist is strongly recommended if excoriation disorder is suspected due to the underlying psychological nature of the disorder. Referral to a psychologist or social worker for CBT and/or HRT. Referral to a dermatologist if there are signs of dermatologic complications (infection, scarring, disfigurement) or a co-existent primary skin disorder. Case: “I'm not the only one with this?" Sally is a 35-yo who comes to your office complaining of itchy skin and a lesion on her forearm that she thinks is infected. She is relieved to find out that she is not alone, that other people have this condition too. You order some tests to rule out other medical conditions that may be contributing. You also recommend the local counseling/therapy services to help with her stress and coping. She learns how to be more self-compassionate and accept that she is not perfect. The urges still come from time to time, but she's able to keep herself from picking. Although there are Practice Guidelines for anxiety disorders and obsessive compulsive disorder, there are not any specific guidelines for excoriation disorder. Arnold LM. Phenomenology and therapeutic options for dermatotillomania. Expert Rev Neurother. 2002 Sep;2(5):725-30. Arnold LM, Auchenbach MB, McElroy SL. Psychogenic excoriation. Clinical features, proposed diagnostic criteria, epidemiology and approaches to treatment. CNS Drugs. 2001;15(5):351-9. Craig-Müller SA, Reichenberg JS. The Other Itch That Rashes: a Clinical and Therapeutic Approach to Pruritus and Skin Picking Disorders. Curr Allergy Asthma Rep. 2015 Jun;15(6):31. Cyr PR, Dreher GK. Neurotic Excoriations. Amer Fam Phy. 2001;64(12):1981-84. Grant JE, Redden SA, Leppink EW, Odlaug BL, Chamberlain SR. Psychosocial dysfunction associated with skin picking disorder and trichotillomania. Psychiatry Res. 2016 May 30;239:68-71. Grant JE, Chamberlain SR, Redden SA, Leppink EW, Odlaug BL, Kim SW. N-Acetylcysteine in the Treatment of Excoriation Disorder: A Randomized Clinical Trial. JAMA Psychiatry. 2016 May 1;73(5):490-6. Grant JE, Odlaug BL, Chamberlain SR, Keuthen NJ, Lochner C, Stein DJ. Skin picking disorder. Am J Psychiatry. 2012 Nov;169(11):1143-9. Mavrogiorgou P, Bader A, Stockfleth E, Juckel G. Obsessive-compulsive disorder in dermatology. J Dtsch Dermatol Ges. 2015 Oct;13(10):991-9. Park KK, Koo J. Skin picking (excoriation) disorder and related disorders. Last updated Aug 2016. UpToDate (online). https://www.uptodate.com/contents/skin-picking-excoriation-disorder-and-related disorders (Nov 8, 2016, date last accessed). Schumer MC, Bartley CA, Bloch MH. Systematic Review of Pharmacological and Behavioral Treatments for Skin Picking Disorder. J Clin Psychopharmacol. 2016 Apr;36(2):147-52. Selles RR, McGuire JF, Small BJ, Storch EA. A systematic review and meta-analysis of psychiatric treatments for excoriation (skin-picking) disorder. Gen Hosp Psychiatry. 2016 Jul-Aug;41:29-37. Silva-Netto R, Jesus G, Nogueira M, Tavares H. N-acetylcysteine in the treatment of skin-picking disorder. Rev Bras Psiquiatr. 2014 Jan-Mar;36(1):101. Snorrason I, Olafsson RP, Flessner CA, Keuthen NJ, Franklin ME, Woods DW. The Skin Picking Impact Scale: Factor structure, validity and development of a short version. Scand J Psychol. 2013 Aug;54(4):344-8. Ravindran AV, da Silva TL, Ravindran LN, Richter MA, Rector NA. Obsessive-compulsive spectrum disorders: a review of the evidence-based treatments. Can J Psychiatry. 2009 May;54(5):331-43. Stargell NA, Kress VE, Paylo MJ, Zins A. Excoriation Disorder: Assessment, Diagnosis and Treatment. The Prof Counselor. 2016;6(1):50-60. Scheinfeld NS. Excoriation Disorder. Last updated Jan 2016. Medscape (online). http://emedicine.medscape.com/article/1122042-overview (Nov 8, 2016, date last accessed). Turner GA, Sutton S, Sharma A. Augmentation of Venlafaxine with Aripiprazole in a Case of Treatment-resistant Excoriation Disorder. Innov Clin Neurosci. 2014 Jan;11(1-2):29-31. Written by Dr. Tania M. Fantin, Family Medicine Resident, Class of 2017. Reviewed by members of the eMentalHealth.ca Primary Care Team, which includes Dr’s M. St-Jean (family physician), E. Wooltorton (family physician), F. Motamedi (family physician), and M. Cheng (psychiatrist).